There are many ways for you to beautify your home, but with the right combination of materials, you can do more than that; you could actually increase the value of your home as well. But, it’s not always easy to find unique ideas that will make your home stand out. In most cases, a complete overhaul is not necessary. By simply changing a few features, it is possible to give your place a whole new facelift and not break the bank in the process. One way to do that is with natural stone. Not only is it less costly, it is much easier to care for than many other types of materials, and when used in the right way, is even more energy efficient. There are five different ways to enhance your interior with natural stone and completely change the look of your interior. Because the fireplace is usually the most commanding feature in any room, your eyes will naturally be drawn to it anytime you enter the room. A well-constructed stone fireplace gives your home a delicate elegance and a bit of old-world charm. Remodeling your fireplace with natural stone creates a chic and modern look that will make it seem more like a work of art than a functional tool. To add a little elegance to your home, take a lesson from thousands of years of history by adding a column feature to your interior. These have a way of adding a bit of classic grandeur in an eye-catching way, especially if you have a large room that needs a little perking up. Whether you use Doric or Tuscan style, the details of the stone can be as elaborate or as simple as you want. Columns create a nice focal point and serve a utilitarian purpose when they are used as an extra bit of support for upper floors. Interior archways give your home a clean modern look and are easier to add than many realize. They soften the sharper edges of the room, making them feel more inviting. 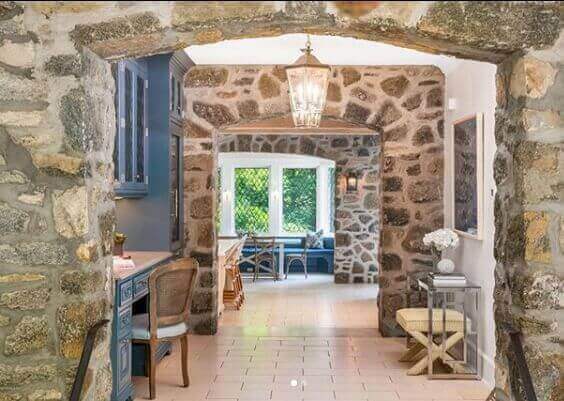 Since so many homes have that boxy feel, adding a few arches to seamlessly connect the rooms makes your home look like it has been custom designed. With the right stone archway, an ordinary room is more likely to make anyone feel special when they enter. Stone paneled walls bring the feel of the outdoors into your home. Mixing the various elements with other natural materials like wood, pebbles, or glass provide an appealing look to the eyes. When natural features are blended well together, especially in larger rooms, it makes smaller rooms feel much larger than they really are. The kitchen is the heart of the home and a stone kitchen hood will steal the eye of anyone that comes in. Even a simple design adds a touch of elegance to an otherwise average kitchen and still be functional. Natural stone brings a sense of warmth and charm to any home. It is a timeless decoration that is not only beautiful to look at but will maintain its beauty and last much longer than many other building materials used in interior design.